Located five miles east of downtown Indianapolis, the Irvington neighborhood features some of the greatest diversity of architectural styles in the city. Founded in 1870, it was name for Washington Irving, author of The Legend of Sleeping Hollow and Rip Van Winkle. Noted for its stately Arts & Craft homes, lush gardens, spacious parks, and a walking district along Washington Street with a variety of restaurants and shops. Irvington is one of the most sought-after areas in Indianapolis, and it's desirability is reflected in the market; listings in this neighborhood tend to move fast. Property values in the area have increased significantly in the past five years. The Pleasant Run Golf Course (above) is one of the many attractions of Irvington. Others include The Irving Theater, the Bona Thompson Memorial Library, the Irvington Farmers Market, Ellenberger Park, and the Pennsy Trail, a 1.2 mile path for walking, running and biking. 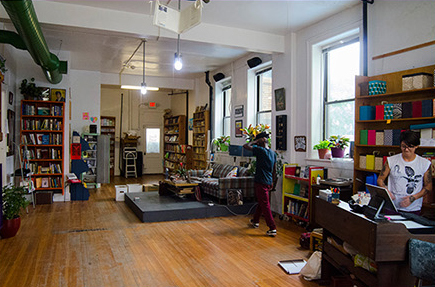 Irvington Vinyl & Books (right) is a hip hangout for record collectors. Nearby shops like Black Sheep Gifts, James Dant Clothing, Guitar Town, The Magic Candle, Indy Cycle Specialist, Jack & Jill, and Inhabit Living offer a variety of goods and services: for grocery shopping, there's an Aldi's on Washington St. and Tyner Pond Farms for local meats and organic vegetables. Jockamo Upper Crust Pizza (right) is one of the most popular Irvington eateries. Black Acre Brewing Co. and the Legend Classic Irvington Cafe are part of the same Washington St. strip along with Lincoln Square Pancake House, Ixca Mexican Kitchen, Super Bowl Pho and Starbucks for a quick cup of Joe. 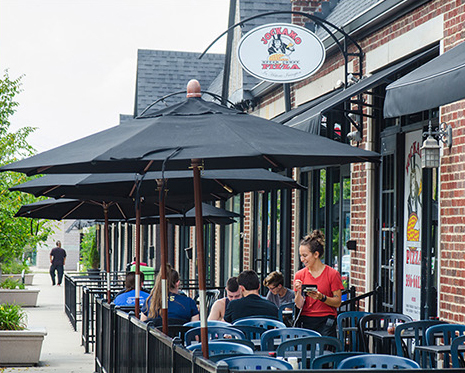 A short jaunt up Audubon St is The Mug, with huge burgers, milkshakes, and hand cut fries; nearby is the Coalyard Coffeehouse, where live jazz and weekly movies happen. Rock-Cola Cafe burger joint is a short drive up Audubon. Homes within the official historic district display the plaque. New construction additions to these homes are required to adhere to a strict set of stylistic guidelines, in order to preserve the distinctive architectural character of Irvington. Irvington LOVES to celebrate Halloween. Each fall, as the leaves change colors, the neighborhood comes alive with the sights and sounds of Halloween, as residents try to outdo each other with extravagant yard displays that would make the Headless Horseman proud. 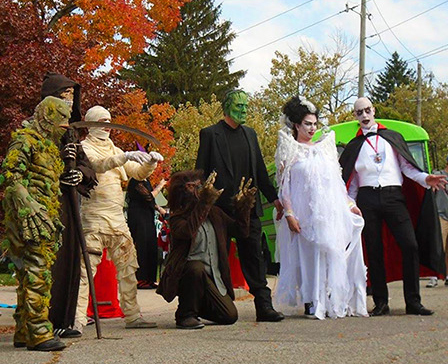 The yearly Halloween festival events include a street fair, a masquerade ball, a ghost tour, a puppet show, costume contests, a silent auction, a 'vampire run' and, of course, trick or treating.